Salmoncat's Entries – nibbling on treats. preening for attention. rolling on paper. pawing through cat stuff. hacking up a fur ball. scoping out the neighborhood and beyond. not the cat. it's a crazy cat not-so-lady on the loose. And so, in case you don’t know, I’m an x-phile. I have been raging on the unavailability of show schedule this past couple of days. Finally, one of the major local dailies, which has been running articles on the show this past few weeks, has posted this schedule. I haven’t tried to catch the show on the replay schedules above but my sister was able to watch the replay yesterday Saturday. Caught the replays on aforementioned schedule. Oh, and in case, you read this, Oliver Pulumbarit, I hope you would review the new episodes that came out. Please and thank you. I enjoy reading your reviews. Hey! Lookie! Here’s a link to Oliver Pulumbarit’s review. The review was in PDI’s February 17 issue, for those gathering clippings like me. To pad the the wall behind my desk, like the one in the X-Files office or Mulder’s unremarkable house. Sister begs to differ. Says I’m building a nest like Tooms in my room. Sure. Fine. Whatever. Actually, it goes next to Ruel De Vera’s review of the X-Files novel Antibodies. It’s less than two weeks to Christmas and time seems to be hurtling at breakneck speed except when one is stuck in horrendous traffic brought on by the season. A lot of people take joy in cooking for their loved ones but what if you’re too busy with work, shopping and other things that you don’t have time to cook? Or you’re not sure you have enough food to serve your guests? What if you can’t cook? If you live within or near Meralco Village, Marilao Bulacan, then you’re in luck. Here are a few places where you can get food for potluck, to serve your guests and loved ones. Location and Direction: Network Ave. From SM Marilao, take Lias Road then turn right at the first street (Network Ave.) after Villa Filomena Resort. Keep going ’til you reach the Meralco playground next to the Our Lady of Fatima Parish. It’s the three storey house. Tetoks has been around for years and people from the neighboring areas, may have had their Pancit Malabon during a party, one time or another. Their Pancit Malabon uses thick rice noodles and is topped with hard-boiled eggs, shredded Chinese cabbage and halved shrimps and boiled pork (salted already). No need for calamansi. The noodles already has a twinge of acid. A single serving in a styrofoam container will set you back by P40. Larger orders are in foil-lined bilaos. They also offer kakanin (native delicacies) which should go well with your pancit. There’s puto, biko, sapin-sapin, pichi-pichi and cassava cake. 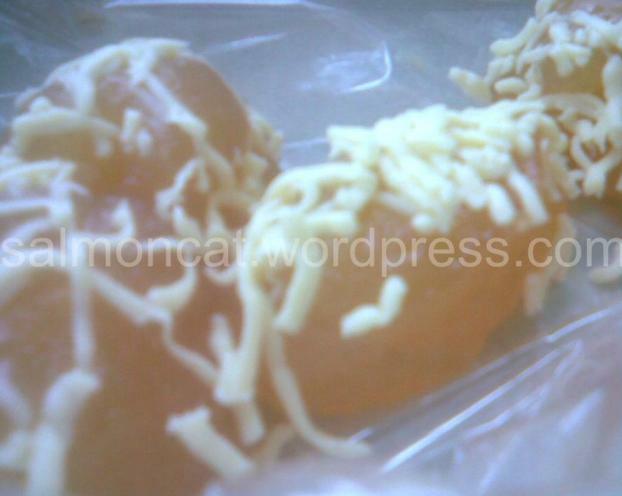 Go for a box of big bite-size pieces of pichi-pichi (gelatinous cassava dessert) topped with grated coconut or grated cheese. They’re soft and gooey and addicting. I think they make their own pichi-pichi while the rest of the kakanin are supplied to them. Thumbs up also for the cassava cake (their cassava cakes have a firmer consistency than their pichi-pichi) they sell. The leche flan (milk custard) on top of each makes all the happy difference. They look like parols (Christmas lanterns) from Pampanga, don’t they? Instead of plied on top of each other, the layers of their sapin-sapin (gelatinous dessert made of rice flour and coconut milk) converge around sweet sticky rice centers known locally as biko. The different colors correspond to different flavors: the violet, purple yam; white is coconut milk; yellow orange is jackfruit; red is anise; yellow is flan, brown is brown sugar. 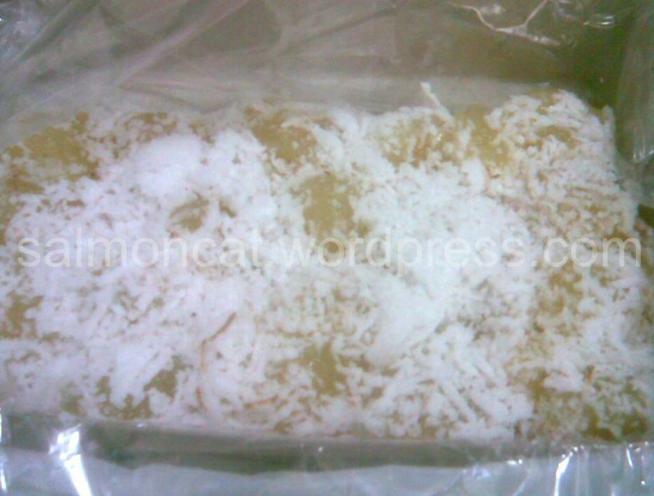 Their sapin-sapin comes with a packet of toasted desiccated coconut. Between you and me, I can’t get enough of the biko’s latik (coconut curd topping). Edited April 2019: This is MY REVIEW of Nelia’s Pancit Malabon/Tetok’s. My thoughts. My words. My taste buds. It’s not from a PR kit. So of course I’m not happy to see ANOTHER BLOG COPYING what I’ve written and passing it as their own. Location and Directions: Lamp St. From Nelia’s Pancit Malabon, continue along Network Ave. until the second street that branches to the right. Take that street until you reach again the second street to your right. It’s the third house to your left. We highly recommend their lumpiang sariwa / lumpiang ubod. Aling Cora’s lumpiang sariwa / ubod has ubod, tofu, carrots, lettuce and I think a bit of pandan? all tucked into a crepe-like blanket topped with crushed peanuts. Orders come with a savory-sweet sauce sauce. A steal at P35 a piece. The crepe is just the right ratio to the filling and you can tell the ingredients are really fresh. Friends who have tried this were pleased that they were eating healthy stuff that tastes good. A break from the usual sugar and fat laden treats on the dining table. Edited June 2017: Compared to Nelia’s/Tetoks’s, Aling Cora’s Pancit Malabon has thinner noodles. It has more sahog of boiled eggs, shrimp, pork and greens since they’re not just on top of but mixed with the noodles. It’s sauce has no acid. 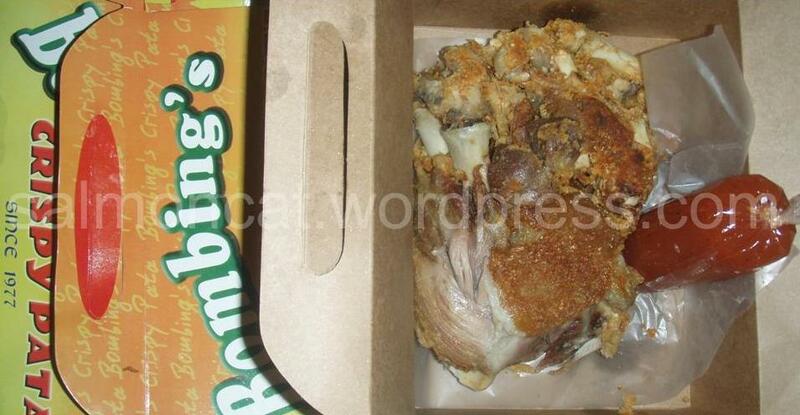 Still if it’s a heart attack you want, there’s Bombing’s Crispy Pata. The meat falls right off the bone. However, it should be consumed quickly since the skin loses it’s crispiness fast. That shouldn’t be any problem at all as evidenced by the pic above. This crispy pata comes with a sweet-sour tomato-based dipping sauce. Wallet damage is around P400+. Arteries, good luck. But your taste buds and tummy will thank you. It’s best to allow a day lead time when ordering. More during days leading to fiesta and Christmas. If you know any food finds in Meycauayan or Marilao, I’d love to know what and where they are. Hopefully we’d have them on our table this coming holidays.